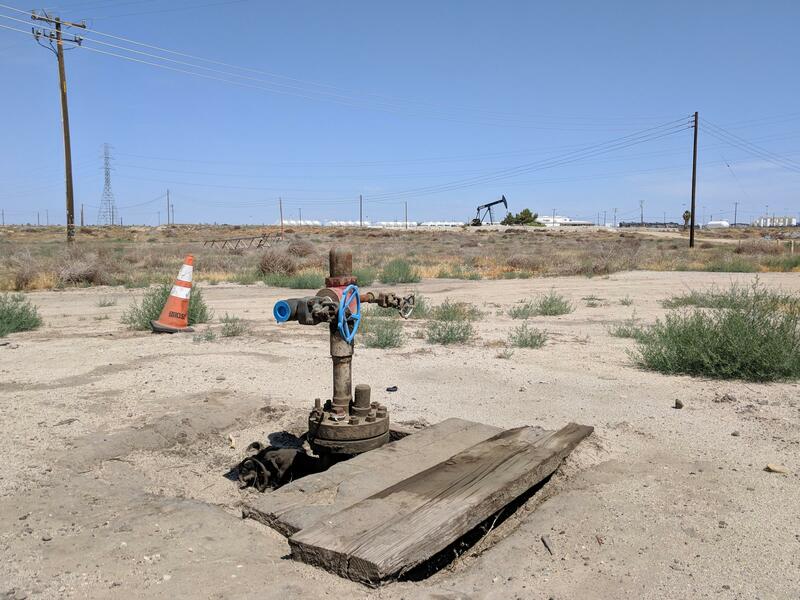 This wellhead in Kern County's Fruitvale Oilfield seals one of Californias 29,000 idle oil and gas wells. Idle wells are typically capable of producing, but for economic or technical reasons, operators may choose to keep them on reserve. 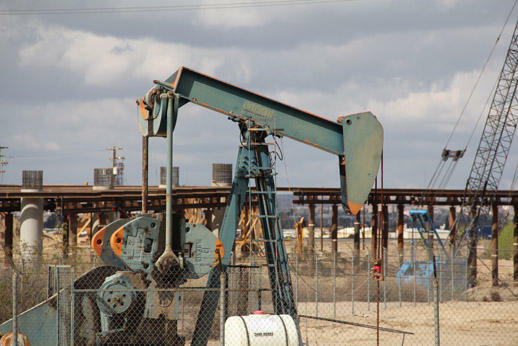 California is the fourth largest oil producer in the country. As we speak, almost 81,000 wells across the state are churning out oil and gas or being used to inject wastewater back into the ground. For every three of those wells, however, there’s another one well that’s not doing any of those things—and yet they, too, can deteriorate and contaminate the air and water over time. Now, a new state law aims to prevent those hazards. Now, he operates a few hundred wells in Kern County. On a warm spring morning, he takes me to some on a sandy, scrubby plot of land in the Fruitvale oilfield just outside Bakersfield. He gestures to a handful of oil derricks dipping in the distance. “These are called pumping units, with the horse head going up and down,” he says. Then he points to a few metal valves jutting out of the ground, unmoving and inert. Those have a name too: Idle wells. They’re not active wells, currently producing oil, but they’re not permanently plugged and abandoned, either. That would involve filling them with heavy mud and cement so they could never be tapped again. Hathaway says idle wells are in limbo, assets ready to be reactivated when they can turn a profit. “It all depends on the price of oil,” he says. Indeed, after oil prices plummeted in 2014, California's tally of idle wells jumped by 10 percent. 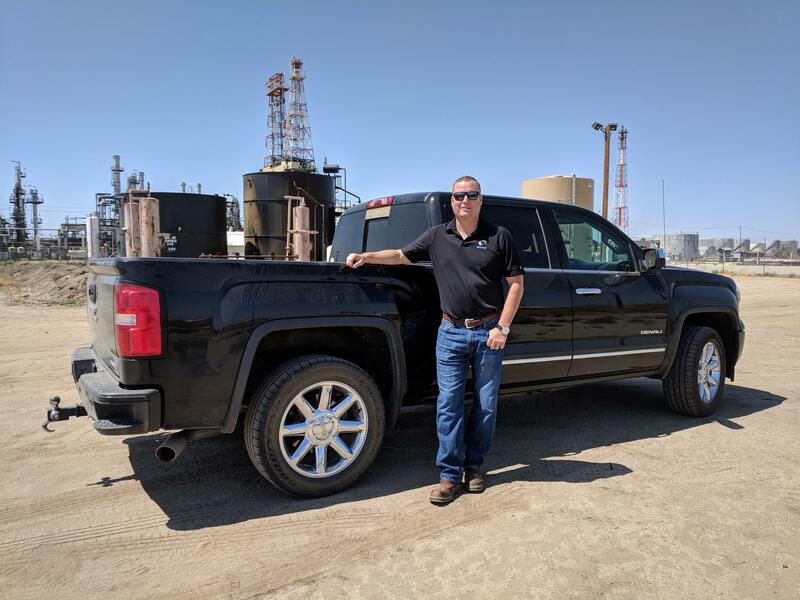 Chad Hathaway is the CEO of Hathaway LLC, an independent oil producer in Kern County with a portfolio of active and idle oil wells. But nothing is foolproof. California has nearly 29,000 idle wells. And they can be risky—environmentally and financially. Even minor leaks of oil or gas could have a lingering impact on groundwater and air quality, and permanently sealing them can be costly. For a few months in 2016, an idle well in Bakersfield leaked a bubbling mix of fluid and steam. A decade earlier, an earthquake disrupted an idle well in Ojai. It leaked as much as five barrels of water per minute for months. But blowouts are extremely rare. In the southern San Joaquin Valley in the 90s and early 200s, less than two percent of blowouts occurred with idle wells. California’s oldest has been idle since 1899. Over two-thirds of California’s 29,000 idle wells are located in the San Joaquin Valley. Many are located in neighborhoods and near schools. The largest owners, no surprise, are megaproducers Chevron and Aera. 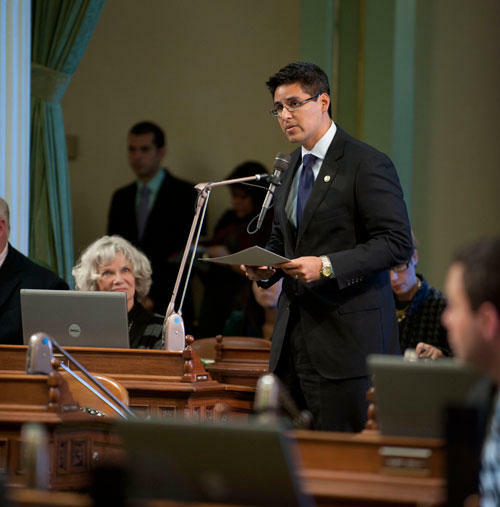 The law, Assembly Bill 2729, forces new rules on oil and gas operators. Starting in January, it give sthem a choice: Either pay an annual fee per idle well, or plug and abandon a fraction each year. It also mandates more frequent testing of fluid levels and structural integrity. The law increases bonding requirements, too, so that if a company goes out of business, the state won’t get saddled with taking care of its wells. Since 1977, DOGGR has spent $30 million plugging so-called orphaned wells. Rock Zierman, CEO of the California Independent Petroleum Association, agrees it’s important to minimize the risks of idle wells. But he worries the financials could break some smaller producers. “It considerably increases the cost of doing business in California,” he says. In Bakersfield, Chad Hathaway agrees AB 2729 is a change of pace for the state oil and gas regulator. “It kind of put some legislative teeth behind [idle well regulation],” he says—“more so than what was before under just the public resources code. Unlike Allayaud, however, he doesn’t think DOGGR was ever too close to the industry in the first place. *A previous version of this story named California as the third largest oil producing state in the United States. As of 2017, it is the fourth largest. A California Assemblyman has introduced a bill that would delay part of the state’s greenhouse gas reduction program for at least three years. Under the bill, energy companies would be able to put off purchasing “transportation fuel pollution” permits. Capital Public Radio’s Max Pringle reports.